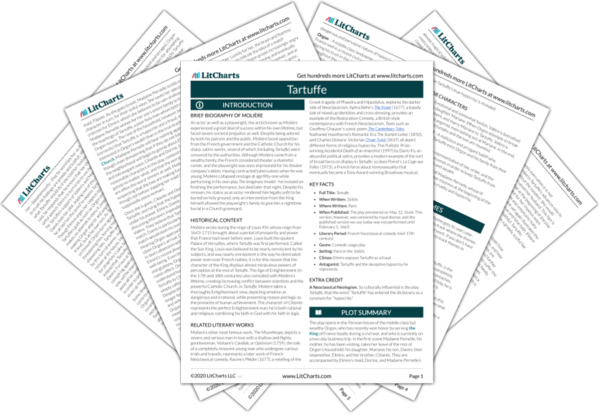 Instant downloads of all 945 LitChart PDFs (including Tartuffe). 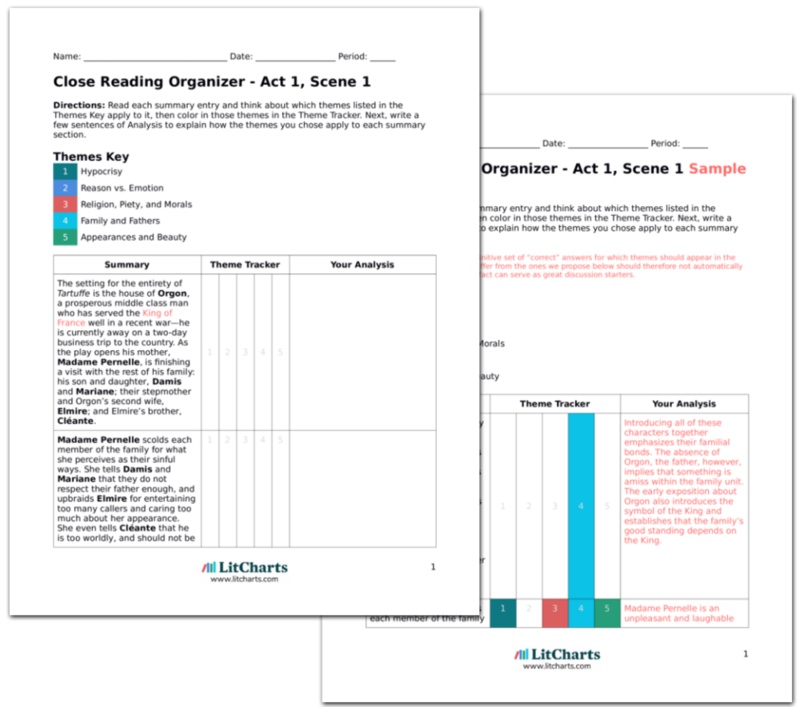 LitCharts assigns a color and icon to each theme in Tartuffe, which you can use to track the themes throughout the work. Tartuffe asks Elmire what she wants with him and, hearing that she has a secret, closes the door to ensure that the two of them are alone (all as Orgon keeps watch from under the table). Elmire, pretending to be flighty and foolish, apologizes to Tartuffe for not defending him from Damis’ accusation, saying that she simply “didn’t have the sense” to do so. She pretends to gloat, saying that she is glad that Orgon has ordered her to spend more time with Tartuffe because it will give them a chance to be alone—and ends her speech by professing her love. In order to uncover Tartuffe’s deception, Elmire acts deceptively herself, pretending to be in love with the hypocrite in order to tempt him into revealing his lust. One might then call Elmire in this scene a “hypocrite” in the strict sense of the word: she is saying what she does not believe. But what separates her from Tartuffe is her intent: she seeks to save her family, while Tartuffe’s in his hypocrisy seeks to ruin it. By pretending to be stupid, and by falsely confessing her love to him, Elmire plays on Tartuffe’s emotions and feelings. With Tartuffe perplexed by her speech, Elmire continues, explaining that women’s modesty often prevents them from speaking their hearts, and that she has been signaling one thing with her words, but another with her actions. She goes on to say that she was calm during Tartuffe’s earlier seduction because his words actually pleased her, that she wished to defend him from Damis, and that she tried to thwart his marriage to Mariane only because she wanted him for herself. Elmire is painting a false picture of women in general as hypocrites and deceivers who say one thing but do another. It is worth noting that this was a common idea about women at the time (and in some ways still is today); think of nearly all of Hamlet’s rants about women, for instance. Here, though, the situation is deeply ironic, of course, because Elmire is talking to the greatest hypocrite of all. Although overjoyed, Tartuffe remains cautious, suspicious that Elmire is pretending to love him only to stop his match with Mariane. He tells her that she must show him physical affection in order to prove her love. Unwilling to be unfaithful to Orgon, Elmire attempts to signal him to reveal himself but he does nothing. Tartuffe, meanwhile, asserts that since he does not deserve her love, he will not believe he has it until she satisfies him in some way. Elmire continues to try to delay, but Tartuffe insists that she give him proof of her affection. A liar himself, Tartuffe knows to be on the lookout for deception. He wants Elmire to back up her words with actions in order to prove their truth—he refuses to be convinced purely by the “appearance” she is spinning with her words. His demand for proof is ironic meanwhile, as this whole scene is in fact manufactured by Elmire to give Orgon proof of Tartuffe’s hypocrisy. Still attempting to delay, Elmire asks Tartuffe if he is afraid of Heaven’s wrath, and the sin of adultery, but he responds that he will teach her how to act wrongly, but remain innocent in the eyes of Heaven. This is the essence of Tartuffe: he acts wrongly, yet always manages to present himself as blameless and innocent. That he phrases it in the way he does here suggests that he sees no difference between tricking men into seeing him as innocent and tricking God into seeing him as innocent. In fact, the statement is dangerously close to conflating what men and God think so closely as to be a denial of God even existing—profoundly not pious. Get the entire Tartuffe LitChart as a printable PDF. Elmire tries to signal her husband by coughing repeatedly, until Tartuffe wants to know if she is ill. He goes on to ask if she is still troubled by the idea of a liaison with him, telling her once again that he will keep their potential affair a secret. Unable to delay any further, Elmire says that she will give Tartuffe “concrete evidence” of her affection. She urges him to see if Orgon is near, but Tartuffe mocks Orgon, saying that his host grows “[m]ore gullible” and blind by the day. After she asks again, however, he relents, and goes to make sure no one is eavesdropping in the hall. Elmire’s coughing and attempts to delay giving Tartuffe “proof” of her love for him are deeply comic. She has engineered this scene to give Orgon proof of Tartuffe’s hypocrisy. But now Orgon—who was taken in so easily by Tartuffe—seems to need so much proof before acting that he is making it almost impossible for Elmire not to go further than she wants to with Tartuffe! Meanwhile, Elmire at last causes Tartuffe to reveal his contempt for Orgon, her ultimate goal throughout this scene. She then uses Tartuffe’s fear of scandal and love of appearances against him, manipulating him into stepping outside so that she can escape his attempts at seduction. Hoyt-Disick, Gabrielle. "Tartuffe Act 4, Scene 5." LitCharts. LitCharts LLC, 21 Jul 2015. Web. 23 Apr 2019. Hoyt-Disick, Gabrielle. "Tartuffe Act 4, Scene 5." LitCharts LLC, July 21, 2015. Retrieved April 23, 2019. https://www.litcharts.com/lit/tartuffe/act-4-scene-5. Teacher Editions with classroom activities for all 945 titles we cover.